Away Team: this is a First Contact scenario. Let the Cmdr take the lead. Russell Sprout takes in the infrastructure of the hanger as his eyes adjust after transport. Everything is grey metal. He waits to be sure the away team have successfully appeared. There is a figure standing by a console. He approaches, softly and gently, so as not to alarm him. Gorwin Jostina is once again working on analysing the data from the prototype, hearing the now familiar sound, and accompanying flash of light that he'd associated with the coming and going of the self-proclaimed peaceful intruders...although why an intruder would be innocent in nature still escaped him. They had established a form a communication in the last encounter by use of written form on a computer terminal, which the only returning member present, the teal and bearded one, had somehow managed to read and manipulate with a similar computer device. He awaited for the intruders to initiate this communication once again. Mysti Lorefield eyes my surroundings and recognized that the consol is a primitive form of computer. I watch the gentleman working but keep silent for the time being, not wanting to startle him. 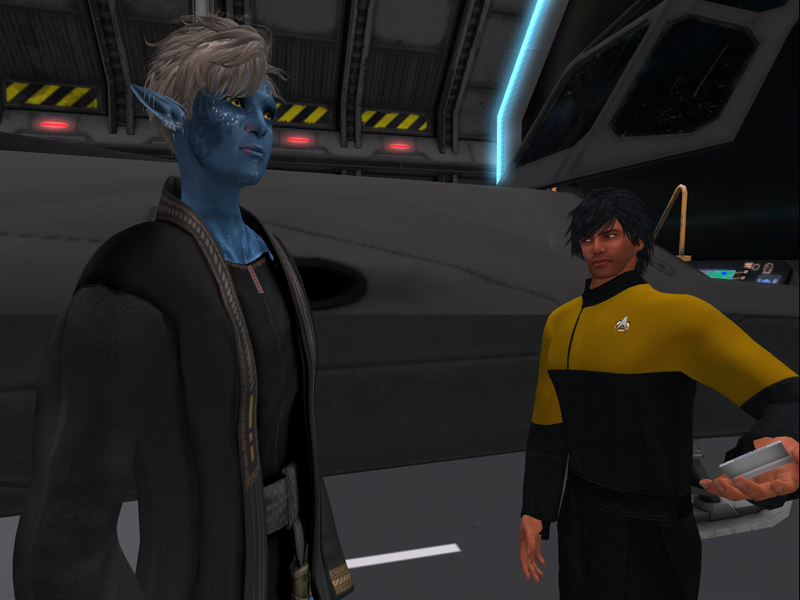 Rhys Careli Axel sees the familiar Vitulan in front of the console and smiles and gives a nod towards him, then starts to take up his tricorder to do his usual scans. 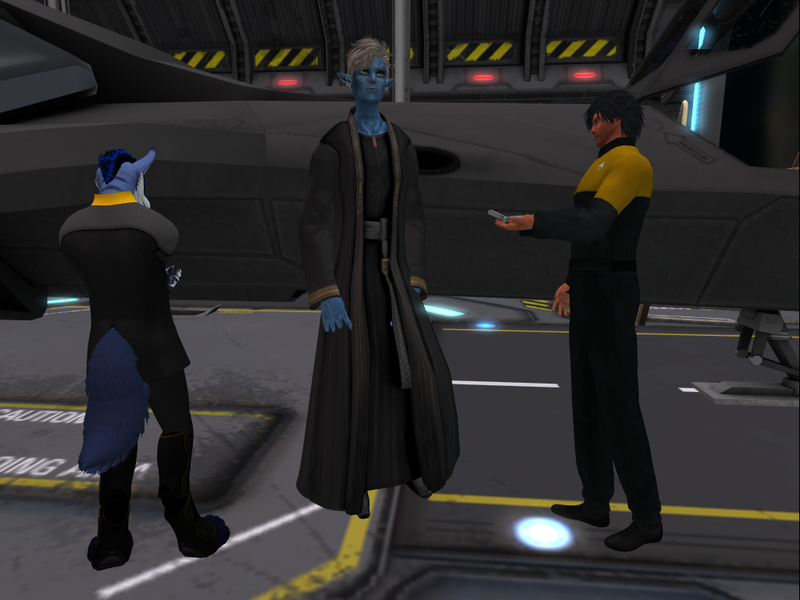 Drathen Frostbite pulls out his tricorder and starts to scan the communication logs and helm controls of the alien vessel, and listens quietly. Sprout smiles kindly at the alien. He points to himself, and says, "Rus-sell." He then takes his tricorder from his pocket, looking to the Vitulan's face as he flips it open. It beeps, ringing loudly in the chamber. He waits to see if there is a reaction to the noise. Gorwin stares at each of the intruders, were they not going to try to initiate communication? What was the yellow jacketed man doing? Was this new, larger team, here for the hostilities, after the initial scouting team? Perhaps the returning one was the one in charge, he seemed the oldest...Gorwin walks towards the person, his towering presence looking down, waiting. Axel looks towards Sprout and says, while Gorwin walks up in front of me, "Most logical thing would be for you to send the message to their computer it seems. As he has only seen me as the returning member of the Away Team." Looks down at his tricorder and examines some of the readings. Karu: So as to not disturb I take a quick walk around ti get better look and check of my surroundings. Sprout nods to Data. "He seems to be looking to you, why don't you send him a greeting, he doesn't appear to hear me... or, spoken language isn't their method of communication. Any sign that the Vitulan are telepathic?" He looks to Drathen, hoping to catch his eye and nod towards the ship, meaning the helm officer might go examine the warp vessel. So far everything feels... relatively calm, but he whispers to Mysti, "Keep an eye out. They may have other ships or.. a protective force." Gorwin watches the older one move his computer around, without attempting to start a dialogue. Perhaps he was having difficulties? Or perhaps he was trying to take control of the prototype - but with technology that enabled the intruders to appear and disappear at will, what use could they have for his prototype? Sabotage? He could build another...and they hadn't hurt him yet. He leans down, closer to the older one, staring more intently, waiting. Lorefield: after extensively exploring our surroundings, I become curious as to what may actually be in the barrels stored on the main deck. Axel changes settings on his tricorder and sends a greeting explaining that Commander Sprout is the language expert and wishes to speak, and that we come in peace as always. Looking back up at Gorwin with a smile after sending the message, hoping he will understand to check computer for message. "Message sent. So now to wait and see if he wishes to speak to you, if he feels comfortable enough to." 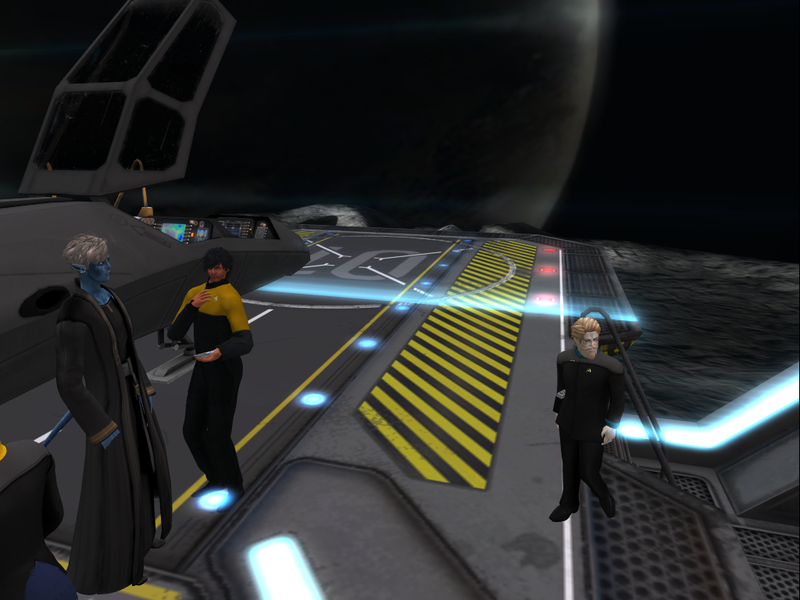 Karu: I stand here quietly as I keep watch of everyone's health on my tricorder, including our Vitulan friend. Frostbite sees the look from Sprout and smiles. He smiles as he wants to see the other ship. He wanders over to it and starts to scanit. He looks at how the ship is piloted and what makes it run. Sprout continues to try to configure his tricorder to convert spoken language to text. Gorwin watches as the old one's eyes seem to follow to a computer, presumably he had sent a message....which Gorwin would read, if his eyes hadn't then been taken by one of the intruders approaching the prototype. He hastily jumped up to the platform, to watch what they were doing - he wasn't going to be distracted whilst they sabotaged the prototype. 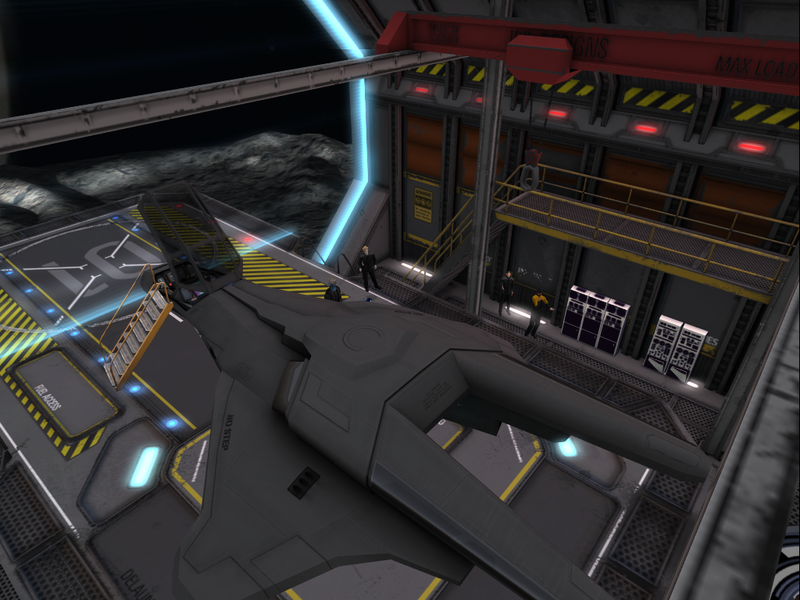 Lorefield looks over the terminal to see if there is a possibility of running a tactical scan. 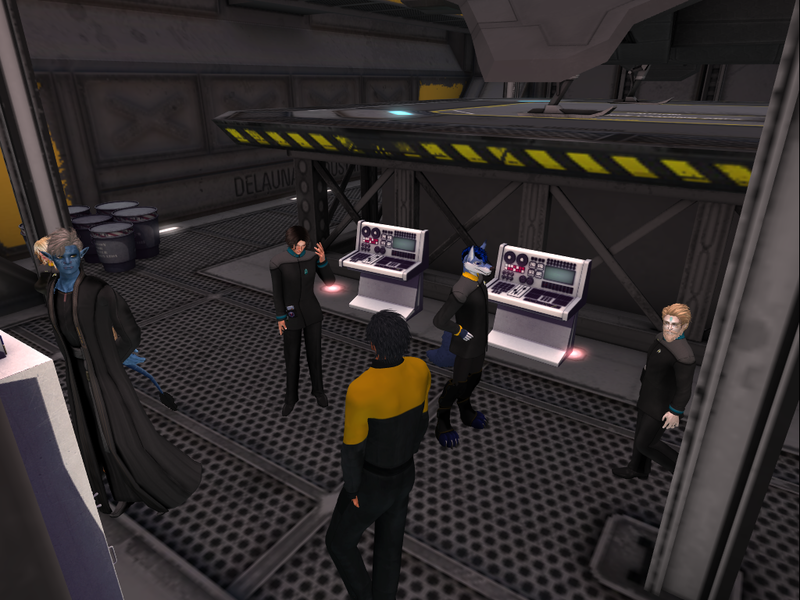 Axel sends a new message as Sprout works on his tricorder saying ‘we are interested and just looking don’t worry’; but sees Gorwin run off towards the ship as Drathen went to look at it. He follows after Gorwin, thinking maybe the alien will relax if he’s closer. Frostbite smiles as he sees the big blue guy walk up behind him. He points at his tricorder showing the Vitulan that he is scanning the navigation and propulsion of the ship and in no way hurting the prototype. Sprout sees that Drathen's interest in the ship has attracted the Vitulan's attention. He quietly takes some images of the computer consoles near him. He moves to the security officer, whispering to Mysti, "while he's interested in Drathen, see if we can set up a remote link from one of these consoles to the Durant." He would pass her a small device that might pick up communication frequencies or telemetry if placed on or near a console. Gorwin looks at Drathen's tricorder, wondering if he was trying to communicate. Seeing schematics for his prototype, it was clear that to him that this was an espionage mission. But why? Axel walks up next to Gorwin and taps his shoulder to try to hint by showing his tricorder with text on and pointing to the computer, that he should look at the messages, while keeping a calm manner. Sprout moves to the stairs leading to the platform. He'd love a closer look at the ship but his first priority is to establish communication. He sees Rhys point to the computer and hopes the alien will respond. He pushes a few buttons on his tricorder, and then looks to the Vitulan, hoping what he says will be transmitted in text to the alien's computer. If the universal translator has done its job... it might look like: "Greetings. I am Commander Russell Sprout of the USS Taylorholic Durant. We come in peace." Gorwin momentarily closes his eyes as the doctor makes physical contact with him, as if he was lost in thought for the duration of the contact. Upon returning to normal, he turns around, and stares at the doctor, first in retaliation to the rude touching, but then wondering if the doctor understood. Lorefield enters key elements necessary to connect a link with the Durant, and looking around presses a button to start the link. Axel looks at Gorwin and nods. Even though curious as to what happened as the alien closed his eyes, I look down on my hands with a puzzled look. 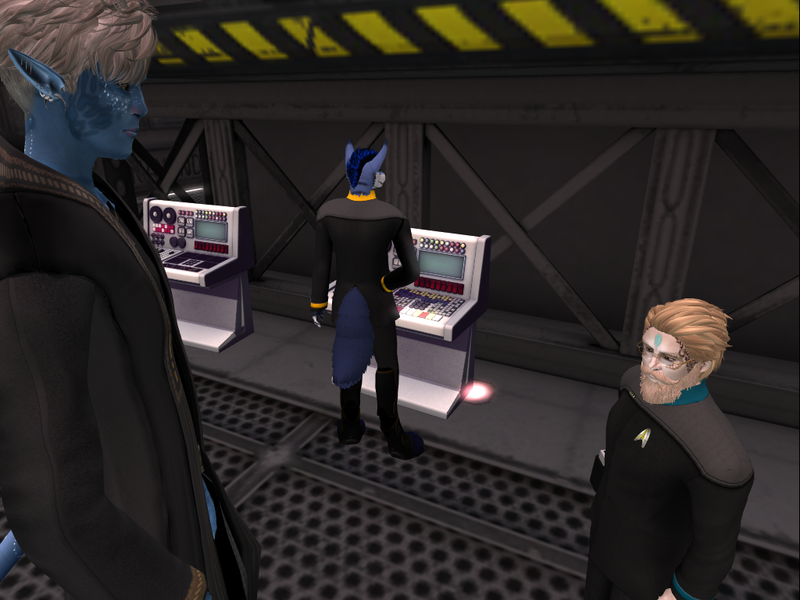 Frostbite: after showing the big guy that he was meaning no harm to his prototype Drathen goes back to scanning, getting all the info he can to see if he can figure out who made the ship. Sprout tilts his head for a moment. He knew what his orders were but they seemed... premature. They had hardly even been able to say 'hello' and somehow he was supposed to get information and cooperation from an alien who, while not being overtly hostile, was clearly suspicious of them and their motives. He didn't blame the guy. He walks up to the tall Vitulan, and would reach to touch his arm lightly to get his attention, saying again into the tricorder he'd configured to translate his words: "Greetings. I am Commander Russell Sprout of the USS Taylorholic Durant. We come in peace." Lorefield: after securing a link with the Durant, I begin transmitting information from the hangar’s archives to the Durant's vast array of interstellar information. Axel looks over the readings his tricorder does seeing a few spikes. Frostbite gets the same spike in his tricorder but doesn't want to show any interest to the alien. He switches to a different scanning frequency. Some of the parts look oddly familiar and he leans in for a closer look at one of them. Sprout first listens and looks for a reaction to what he's said out loud... nothing. But then he remembers, there *was* a response. But not to the sounds he made. He reaches out to touch the alien's arm again, this time looking into his face, and saying slowly - "I am Russell." Lorefield: After I establish the link with the Durant, I join the rest of the crew on the platform. Axel sees how Sprout and the alien interact and stands fascinated looking at his tricorder. He does some additional scans of both of them while they are at it. Frostbite blinks: “Sir some of these parts are based off Starfleet specs. but somehow heavily modified with a signature that I don't understand.” He does another scan. Sprout allows the alien to take his arm. He feels a frisson of excitement now that they have broken through to each other. He contemplates how best to say why they are here. It's immensely complicated with all kinds of nuances in meaning. He's not sure how much the alien will understand of his words, even if he knows a few languages. Perhaps it's more images? He says, "I think I heard him say my name back to me." He tries thinking of his friends, recalling memories of a birthday party on the ship, playing cards, dancing with a girl. "Friend," he repeats each time. He then says, "We wish to be your Friend." He hears Drathen's report with some concern but doesn't react. He stays focussed on the Vitulan. Lorefield: Being a Vulcan I have the power of telepathy, so I decide to experiment and see if I can read the alien's thought patterns without performing a full mind meld. Axel continues to document the interaction and write up all the spikes and changes in both of them. Frostbite: “Sir from my reading part of the propulsion is heavily based of our own from five years ago.” He pulls up the specs on his tricorder to show the differences and the modification that was done in this model, and passes it to the commander. Sprout takes the tricorder from Drathen with his free hand. He sighs. "Okay," he says out loud. "There's some kind of connection when we touch each other. Not very clear yet." He tries to empty his mind, and then form a picture of the Durant. "Ship," he says. "Vessel. We have a ship, like yours." He nods his head a couple of times to the Vitulan ship. Gorwin finds himself nodding also, this time the message was more clear: 'Ship. Faster than light, also?' He uses his grip on Russ' arm to place their hands on the prototype, establishing the connection between the thought and the real world manifestation for clarity. Lorefield: I decide not to try and intervene by reading the Vitulan’s thoughts, but notice that there is good connection between Sprout and the alien. Axel listens to the commander and continues to look at the tricorder: "Well the readings do show there is some kind of communication by physical touch or something like that. Very fascinating to see how that works." 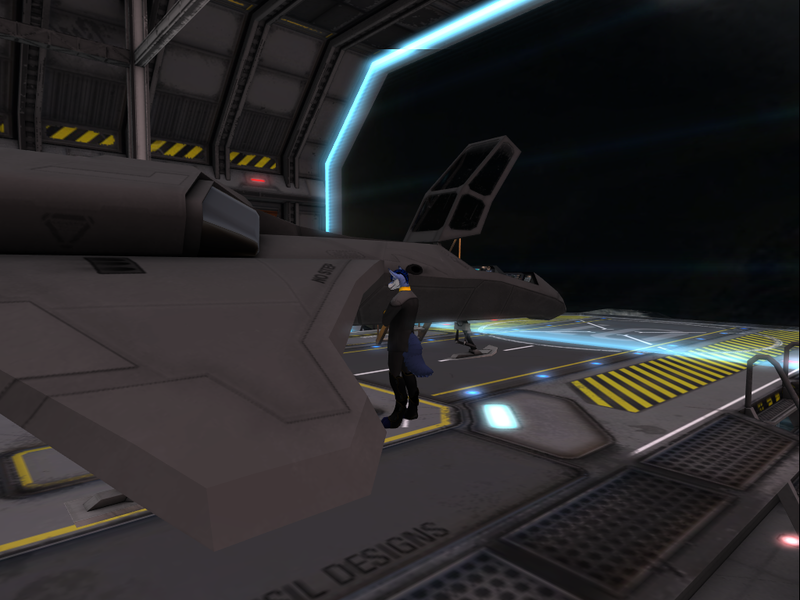 Frostbite stands by and waits for further orders as he is unsure how the construction of this ship is possible without outside interference. He looks at the commander. Sprout allows his hand to move with the alien's as they both touch the ship. "Yes." he replies. "Fast ship," he says with a brief smile. 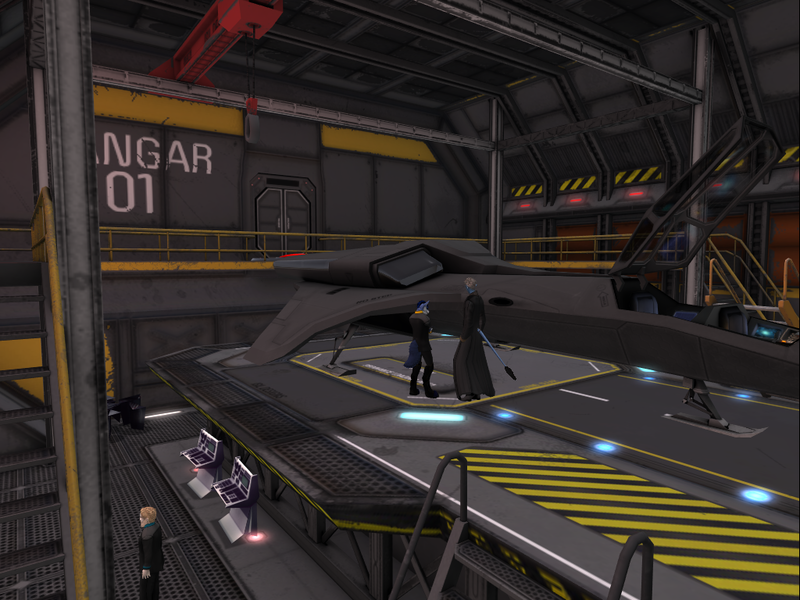 We beamed into the hangar on Vitulus II moon, Palar. The first person I see is the familiar Vitulan in front of a console there. He turned around and seem to know me and walked up to me. So I told Cmdr. Sprout to initiate contact with him, in hope that he would see that I am not the leader of the party this time. Who told me to start it off. 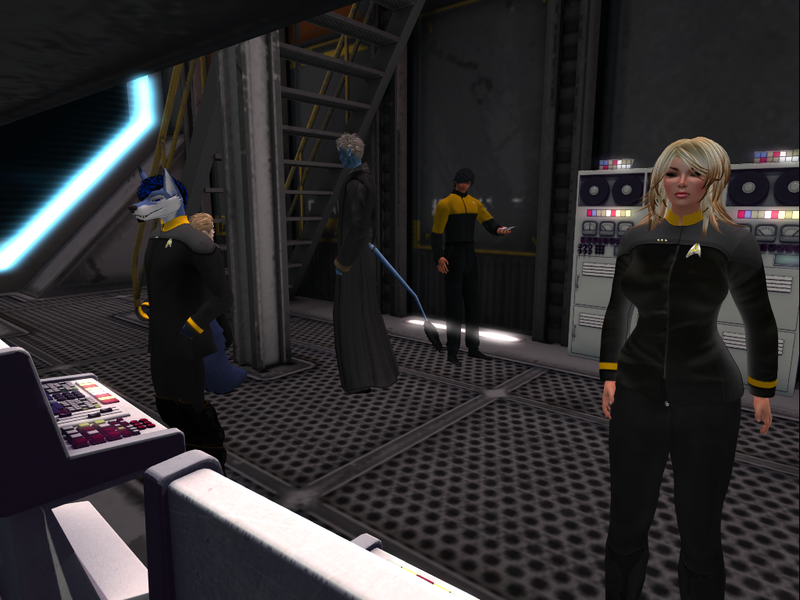 As Sprout was working on his tricorder I carried on the conversation trying to tell him we are still just looking at things and does not mean anything bad, but he ran off after Lt. Drathen as he went to look at the ship. So I went after to keep a known face close to the alien in hope that it would keep him calm. I kept trying to get him to check his messages on the computer so it would easier for him to understand everything that went on. When I touched him on his shoulder to get his attention, he closed his eyes like he spaced out. I am curious as to why that is. Maybe it is the way they communicate it seems? 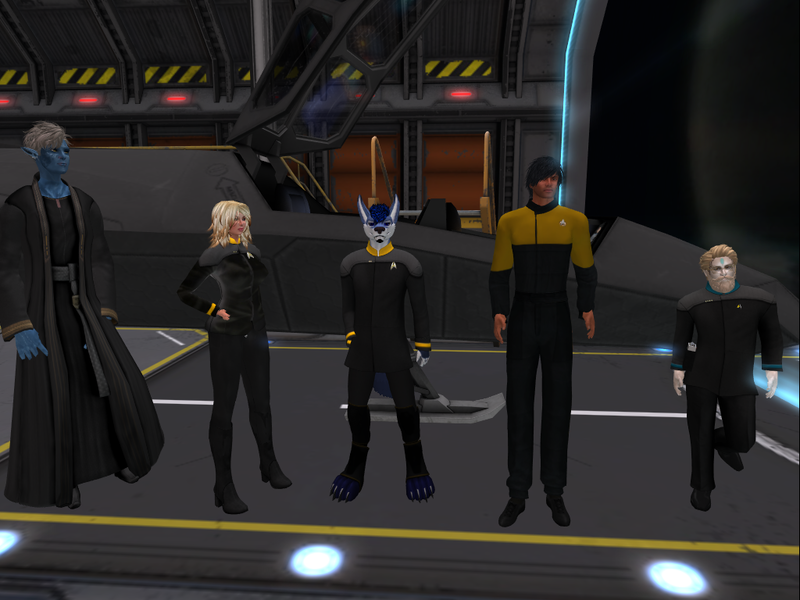 And so it seemed as the Vitulan and Sprout locked arms together, and my tricorder started spiking so I continues to scan and look over readings while it went on. Showing higher blood pressure and some brain wave signals are getting elevated by the interaction. This is clearly something I must take more scans of and look into, there are not many species if any I know of that speaks by touch.